An interview with Katie Lawrence. I’m sitting in a café at McLaren headquarters with Katie Lawrence. Surrounding us are some of the fastest cars in the world. They are displayed on glassy pristine floors under meticulous lighting. Men walk by in smart suits or mucky overalls and brush non-existent flecks of dust off the cars as they pass. Beyond a wall of windows is a vast lake. It is all very James Bond, even for Woking. Petite and softly spoken, Lawrence might not be what people expect when they picture a motorsport engineer, but the 27 year-old has been running the show from the McLaren pit-lanes for five years. She certainly isn’t going to let a little thing like gender stereotyping get in the way of working her way up the McLaren chain of command. Six months ago Lawrence was promoted to senior track engineer in the commercial side of the McLaren empire. She oversees a team of seven that will be racing McLaren’s new £2 million supercar – a fast and expensive limited edition race car produced for private buyers – that Lawrence herself spent most of last year developing. She oversaw all aspects of the manufacture from designing and making car parts to testing it once it had been assembled. There are six races planned for the slick yellow supercar – an image of which continually flashes up on a screen behind us – including tracks in Mexico and California. The unglamorous side of things become clear when Lawrence tells me about a race she worked at last year in Germany. This track, a 25km circuit south of Cologne, is one of the world’s toughest. On the Thursday before the race was set to take place, the driver hit a hare on the track’s fastest corner and destroyed the front of the car. With Saturday’s race looming, the team had just hours to rebuild the car from scratch. “We slept for nine hours in total over a four-day weekend,” says Lawrence. Exhilaration flashes across her face, even as she recalls the weary looks of her sleep-deprived colleagues. Teamwork and the adrenaline rush of working in a high-pressure environment are what motivate her. Accidents like that happen frequently and when they do it is all hands on deck. The job of a race engineer involves everything from planning races, to developing car parts, to picking up a spanner or a cable tie in order to build or rebuild a car. Most Formula 1 and other race engineers will have a degree in mechanical or motorsport engineering and will work their way up in the industry through different teams on the grid. Lawrence took a less traditional route. She studied mathematics at Royal Holloway for her first degree and then took a master’s degree in aeronautics at Imperial College London. Lawrence’s work ethic is impressive. 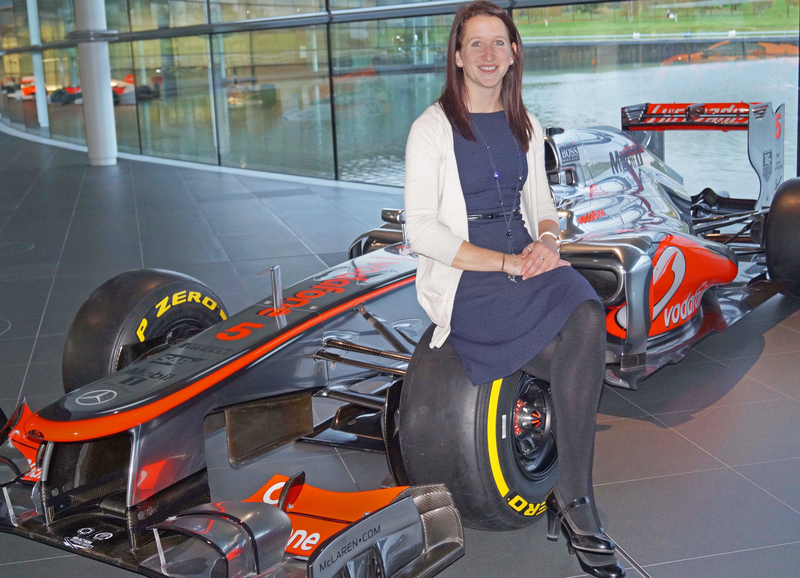 After completing a year-long graduate scheme at McLaren Racing, the company paid for her to take a part-time management master’s degree at Kingston University. She worked 8.30am-5.30pm during the week and attend lectures 9am-6pm on the weekends that she wasn’t racing. Before work she would commute an hour from Wandsworth – where she lived before moving to Guilford – to do circuits in the McLaren gym at 7am. After work she stayed late to study. Her life sounds a lot like all work and no play. Nothing in Lawrence’s life is merely a hobby. Her second passion after race cars is riding, where she has competed at a national level. At 16 she represented England in a dressage championship in Ireland. Relaxation comes in the form of visits to the family farm, which is roughly eight miles outside of Canterbury. Her mother is a barmaid and her father is the all-round village handyman. Her younger brother works on the farm. Lawrence was the first in the family to study a subject other than agriculture. Lawrence finished her management degree last January and was awarded a distinction. With her weekends back and her new promotion, Lawrence jokes that she will now have lots of free time to enjoy. Having been extremely career-focused for so many years, it is now time for her to sit back and enjoy the ride. Qualifications: A higher degree in some form of engineering that includes a work placement year. This will usually be a MEng. Formula Student is a university scheme that builds knowledge and contacts in the industry. Apprenticeships and/or graduate programmes are highly recommended.